Imbolc (February 2) is a Pagan holiday that celebrates the first signs of spring and the return of the sun. It’s also a day to celebrate the Celtic Goddess Brigid. 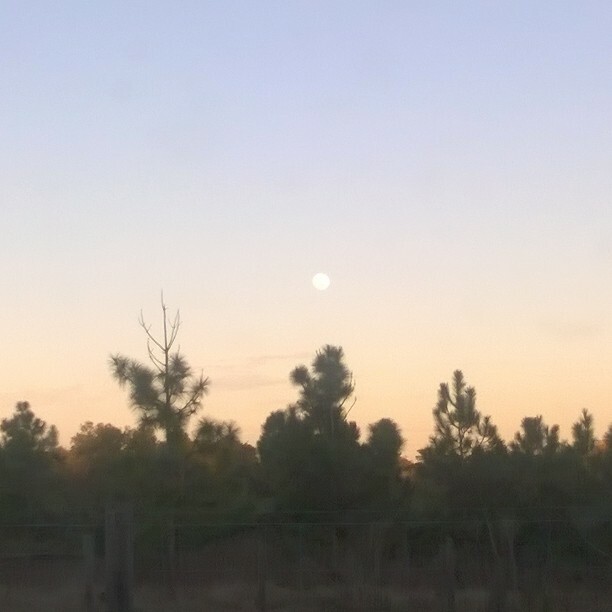 This is a Sabbat of purification after the shut-in life of Winter, through the renewing power of the Sun. It is also a festival of light and of fertility, once marked in Europe with huge blazes, torches and fire in every form. Fire here represents our own illumination and inspiration as much as light and warmth. Imbolc is also known as Feast of Torches, Oimelc, Lupercalia, Feast of Pan, Snowdrop Festival, Feast of the Waxing Light, Brighid’s Day, and probably by many other names. Some female Witches follow the old Scandinavian custom of wearing crowns of lit candles, but many more carry tapers during their invocations. Since I am ChristoPagan, I focused more on the purification and renewing part of the holiday rather than Brigid. 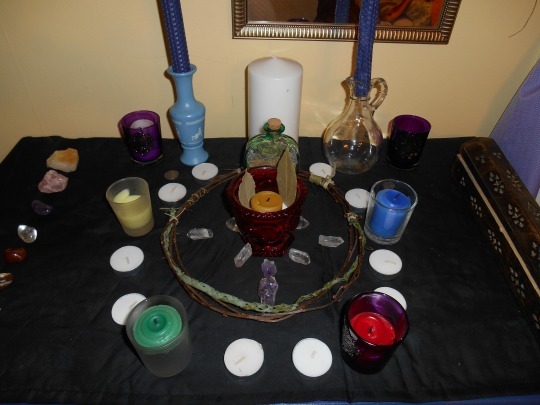 I also practice in solitude, so to celebrate Imbolc I just held a cleansing/purification ritual and meditated. It actually went rather well. For this particular ritual it was meant to be alone. 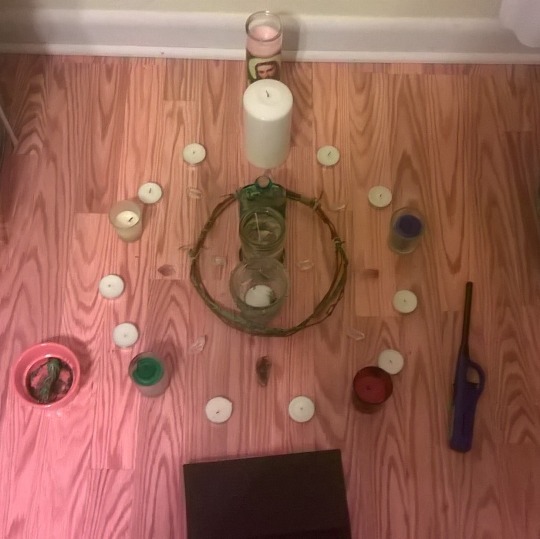 I am working on purging myself of some bad habits and this ritual was to help with that. In the red dish is salt (purification/cleansing) with bay leaves (represent wishes and growth). On top of the salt I put a beeswax tea light candle. 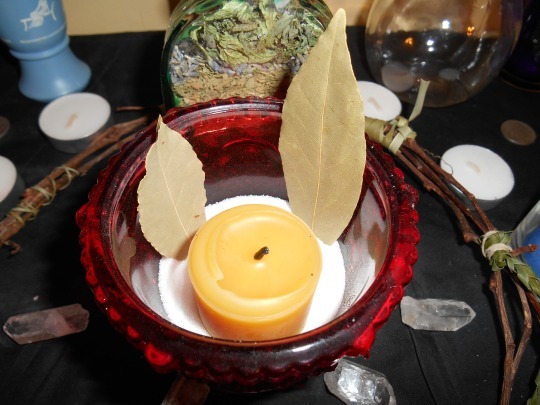 Beeswax candles purify the air when they are lit and I used it to also represent purifying myself. 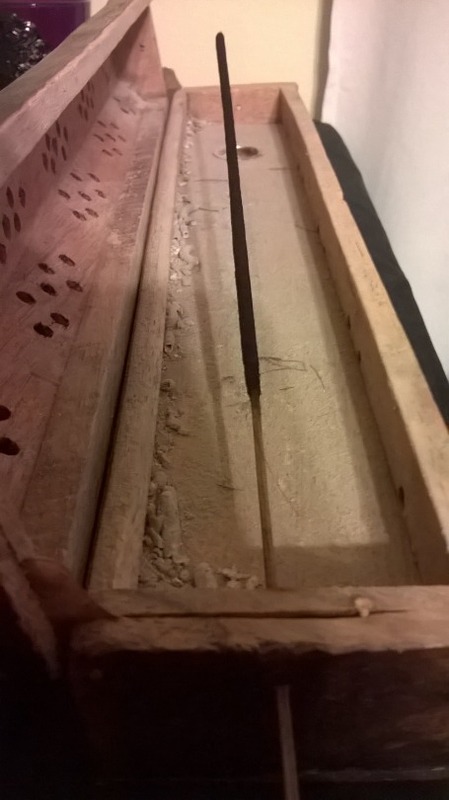 I surrounded the salt dish with amethyst and clear quartz. Amethyst is good for ridding addictions and clear quartz is a major healing crystal. 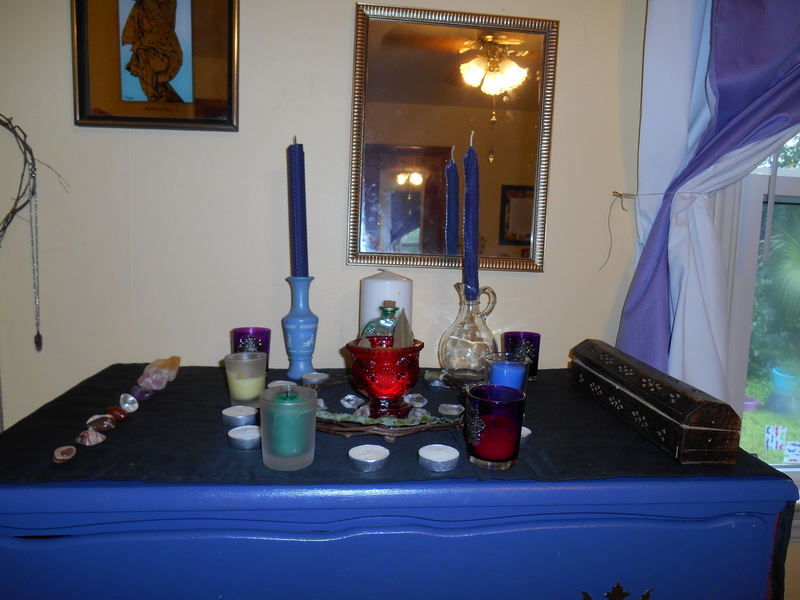 I also used candles the colors of the 5 elements and placed them in their place. I used the white tea lights as just fillers. 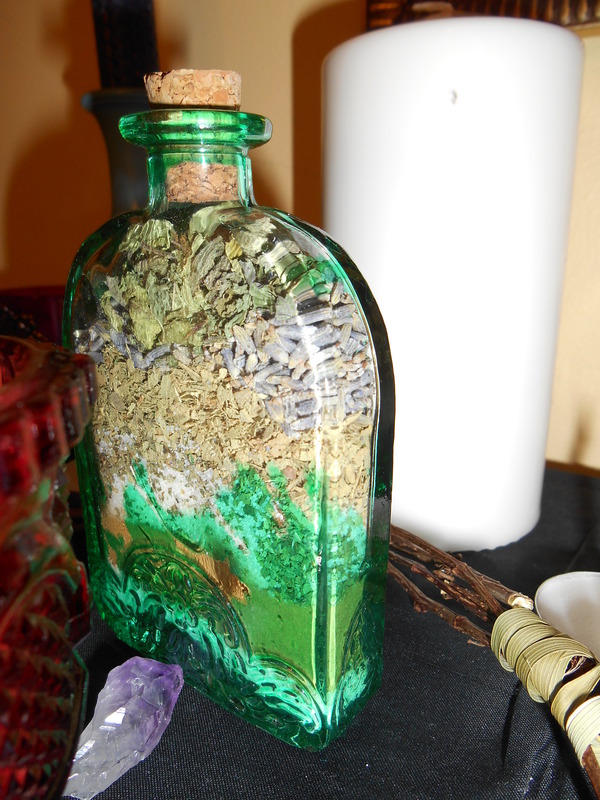 I made a cleansing and healing bottle spell. From the bottom, up: salt, cinnamon, salt again, basil, eucalyptus, lavender, sage, mint, and peppermint. The last three I dried myself. They were the herbs from my garden. 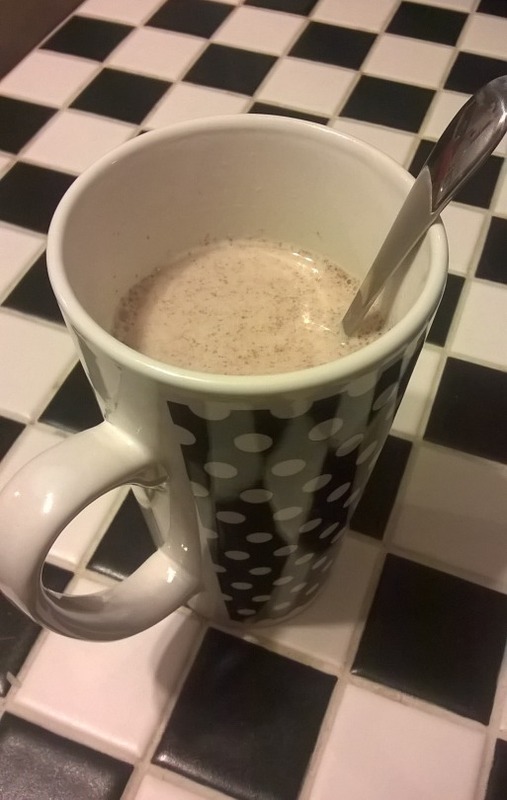 The others were ones I had in my kitchen. 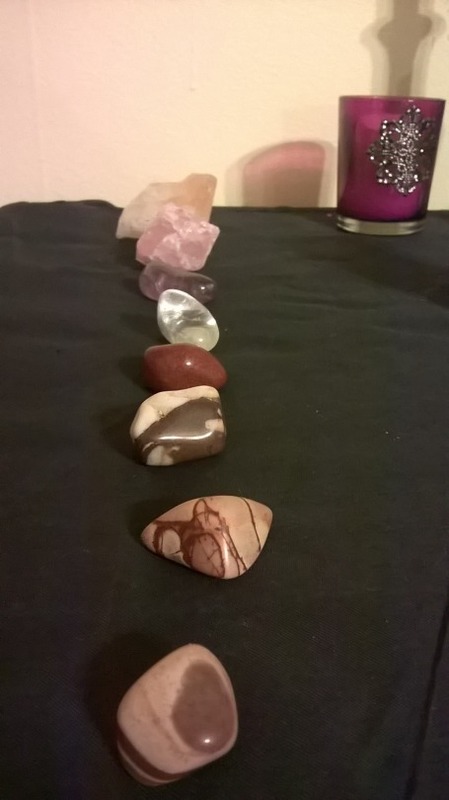 The other gemstones I have lined up are (foreground to background) 3 Zebra Jasper & 1 Red Jasper (healing), Rose Quartz (love & inner peace), and Citrine (protection & healing). I have my sage smudge stick and bowl (the orange one), and my grimoire. 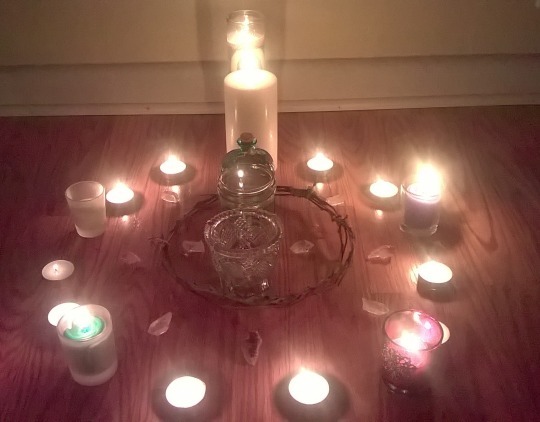 I have kind of set up the way it was on my altar, except here I added a clear dish for a piece of paper I’m going to burn and a spirit candle I made. I won’t go into details of my actual ritual because it’s kind of personal and private. I will, however, show you a picture of everything lit up right before I performed it. 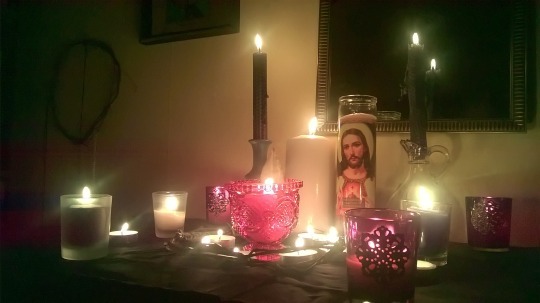 After the ritual, I set up my altar again (a little different this time) and lit it while I meditated. 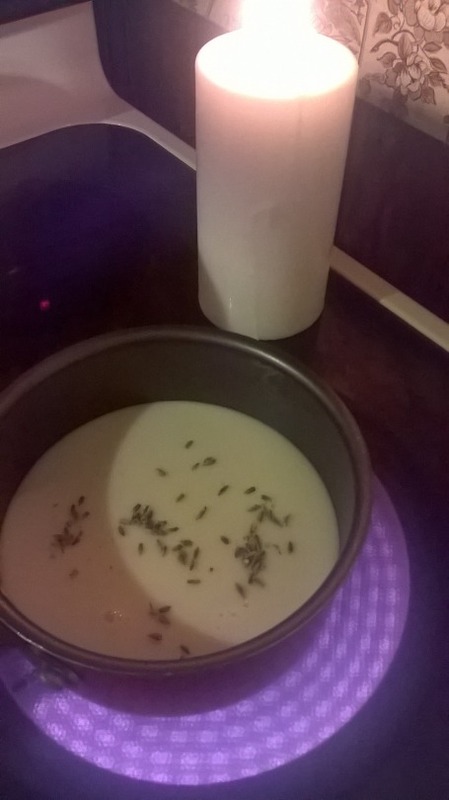 After meditation I made some Lavendar Imbolc Milk Tea. 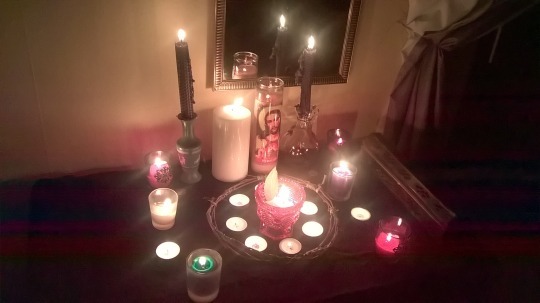 I think it went pretty well for my first Imbolc.